The middle class gets a big raise ... finally! 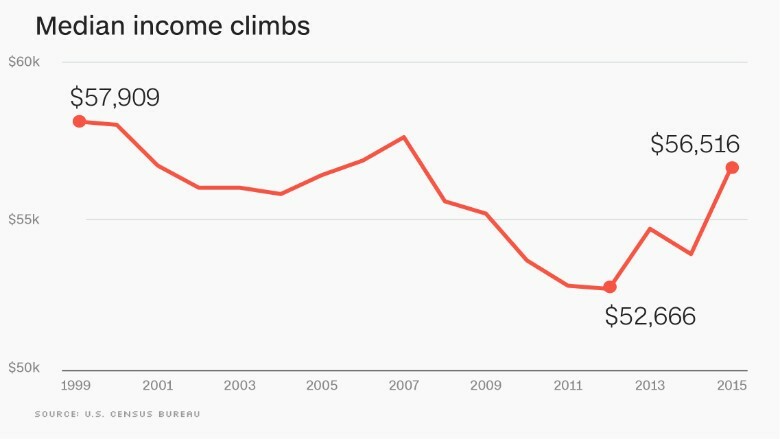 After years of watching their incomes go nowhere, America's middle class finally got a big raise last year. Median household income rose to $56,516 in 2015, up 5.2% from a year earlier, according to data released by the U.S. Census Bureau Tuesday. It marks the first increase in median income since 2007, the year before the Great Recession started. Also, the poverty rate ticked down to 13.5% in 2015, from 14.8% a year earlier. And, the share of those without health insurance dropped below 10%. That's the first time all three measures have improved in nearly two decades, according to the Center on Budget and Policy Priorities. Hillary Clinton, meanwhile, will likely use the uptick to show that the economy is recovering. Median income: The jump in median income was one of the largest annual increases Census has recorded. The growth was also widespread, with geographic regions and races (except for Asians) seeing increases. Behind the pay hike is the big increase in employment, Census officials said. Some 3.3 million more Americans were working full-time, year-round, pushing up median income. Some 1.4 million more men and 1 million more women had jobs last year. "Strong labor markets make a big difference in helping to connect low- and middle-income working families to the broader economy," said Jared Bernstein, senior fellow at the Center on Budget and Policy Priorities. The annual unemployment rate fell to 5.3% in 2015, compared to 6.2% the prior year. The jump shows that the economy is improving, said Sheldon Danziger, president of the Russell Sage Foundation, a research group focusing on social issues. Measures that "encourage increased employment, increased wages and increased health are beginning to pay off and finally matter," said Danziger, citing minimum wage increases and Medicaid expansion as examples. The lowest-income Americans saw their incomes rise the most, while the Top 10% has the weakest growth. Broadly based income gains, particularly at the bottom. Still, the nation hasn't fully healed. Income remains 1.6% lower than it was in 2000, when it hit $57,790, and 2.4% below the 1999 peak at $57,909. Median earnings for men working full-time are still lower than they were in the 1970s, Danziger said. Women have fared better. Their earnings are up 7.8% since 2000, according to the left-leaning Economic Policy Institute. Men's are down 0.1% over the same period. Income inequality, however, remained at the same level as 2014. It has increased 5.5% since 1993. Poverty: The poverty rate is the lowest it's been since 2008, when it was 13.2%. 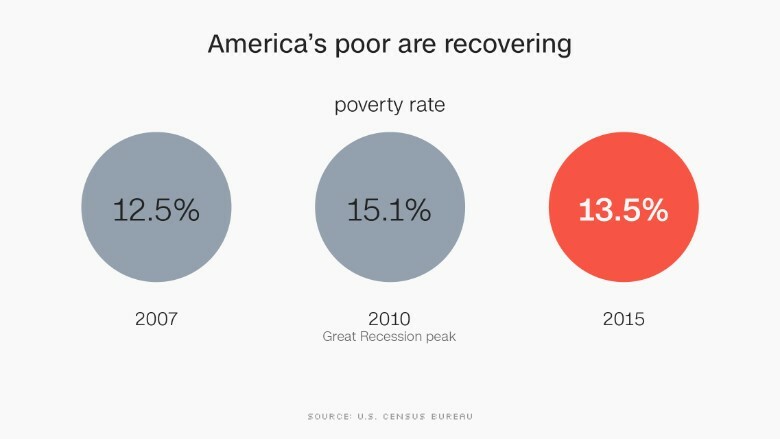 Some 43.1 million Americans were in poverty last year, 3.5 million less than in 2014. The last time the poverty rate went down more than a percentage point was in the late 1960s, Danziger said. All age groups -- children, adults and senior citizens -- saw their share drop. While the poverty rate fell for all races, it remains high among people of color. Some 24.1% of blacks and 21.4% of Hispanics were in poverty last year, while only 9.1% of non-Hispanic whites were. The poverty threshold for two adults and two children was just over $24,000 last year. Trump also references the poverty rate to show that Americans have suffered under President Obama. The rate was at 12.5% in 2007, before the Great Recession hit. It jumped to 15.1% in 2010 and has slowly drifted downward since. The Census Bureau also released an alternate poverty measure that takes into account various government benefits and expenses not captured by the official poverty rate. The so-called Supplemental Poverty Measure showed 14.3% of Americans were in poverty in 2015, compared to 15.3% a year earlier. The supplemental measure showed that non-cash public assistance, such as food stamps, housing vouchers and refundable tax credits, helped lift many Americans out of poverty. However, it also takes into account work-related costs such as transportation and child care, as well as medical and tax expenses, which all together drove more people into poverty. Social Security kept 26.6 million people out of poverty in 2015, while food stamps lifted 4.6 million people above the poverty line, the Economic Policy Institute noted. Health insurance: The uninsured rate fell to 9.1% in 2015, according to the Census Bureau. That's down from 10.4% the year before, when the Obamacare exchanges and Medicaid expansion began. Some 29 million were without insurance last year, compared to 33 million in 2014. The uninsured rate has dropped as millions of Americans gained coverage under Obamacare. More recent government data found that the uninsured rate fell to 8.6% in the first quarter of this year. Some 27.3 million people lacked health coverage, according to the National Health Interview Survey, published by the Centers for Disease Control and Prevention.